You can make part sheets with almost anything – frit, stringers, scrap and even scrap from other part sheets. It really is up to your imagination. I’ve made a number of parts sheets, but this one uses only powdered frit. The inspiration for this sheet was watching a slow motion video of a drop of water as it hit a hard surface. That made me wonder what would happen if it hit a surface covered in powdered frit. How would the frit behave? 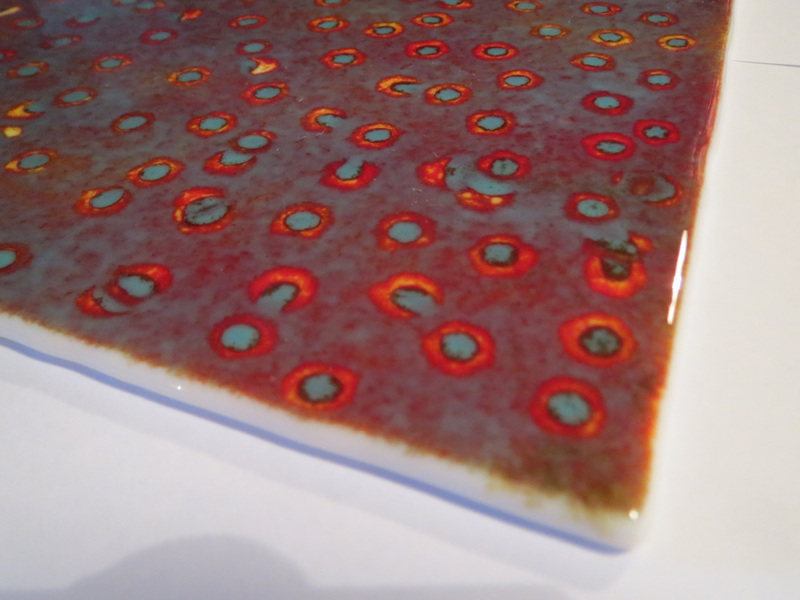 I imagined that the drop falling on the frit would expose the coloured frit underneath, but also blend the colours and maybe result in a ray pattern. In hindsight, the colours I chose were never going to achieve what I imagined, but I still love the final result. So first thing was to choose the base glass. In this instance I chose Bullseye Opaque White. This I decided to cover with a three layers of different coloured powder frit. First colour was to be yellow, then a middle layer of red and finally a turquoise over the top. These are all opal, not transparent, though that could be something to try. Sorry, no photos to show this process, but it really isn’t that difficult. I first laid out a few sheets of newspaper to catch the frit as I sprinkled it on the glass. On this I set a few scraps of glass to act as supports, then laid my base sheet on the scraps. This raised the base sheet off the paper so it would be much easier to pickup later. Please, please, before working with powdered frit always take all the necessary safety precautions and put on a suitable dust mask at least. This stuff is dangerous. When finished, clean you area with a vacuum (be sure it is suited to super fine materials). Carefully, I then sifted a layer of yellow frit over the base, trying to keep the layer even. In my case I added a reasonable depth of frit, but you could vary the depth to get different effects. Over this I sifted a layer of red and then a layer of turquoise. I then took a syringe, less the needle, and filled it with water. You can get these from chemists, vets etc. From a height of about 6 or 7 cm I then dropped single drops of water onto the surface in a random pattern. These photos show the result. Not quite a ray pattern, but even more intriguing. The drops have retained the top layers in the middle but exposed the lower layers in a circle. I don’t know the mechanics of this but it certainly wasn’t what I expected. While doing this I did notice that as the frit became waterlogged the effect was less pronounced. You will need to do this quite quickly to keep a consistent effect. Something else I noticed is that quite a different effect is achieved by varying the height. This was then left overnight to dry out. I cover all my pieces with a container to keep off any dust or other unwanted additions. By this I mean bugs which have found themselves onto my pieces and got stuck in drying glue. Something to consider always. Fuse this to a full fuse. Just try to limit the fuse to reduce the pull in on the sides. This will happen if you have used a single 3 mm base sheet. If you double up with two sheets this isn’t a problem. The firing schedule is below, as usual. So what do you think? I love it and have since created a number of part sheets that have been incorporated into bowls, plates and even jewellery pieces. Give it a go and don’t be afraid to experiment. Very interesting concept there Jeff. I like how some of the slash marks left a not quite complete circle and more like a horseshoe design. Did you try doing any where your dripped the water on it with maybe one layer of frit and then covered with your remaining two layers? Wondering if you would get the droplet particles around the circle perimeter that you talk about earlier on. Will give it a go and let you know the results. Thanks for the article. Been only doing this fused glass for a year but experiments are the best. Thanks Jon. Experimenting is the best. Always a surprise and always fun. Look forward to hearing about how you go.